Here at Marshall military sales our team is a selection of hand-picked personnel and every member brings a unique offering to our forces business. Grown over many years our dedicated staff constantly strive to excel in the pursuit of excellence in customer service. Their contribution is measured in the positive feedback we received from our customers. From the initial enquiry to the day of collection and beyond, we always endeavour to meet our customers’ expectations; our enthusiasm is a personality trait that cannot be learnt, we are a team that’s dedicated and passionate about customers. Our Customer First Principles are born from our global customers’ needs and expressed in their words. The Principles are part of the ongoing journey we’re all taking, helping us to create and deliver experiences customers remember for life. Our Jaguar Land Rover professional and highly qualified sales team are standing by to assist our forces customers through phone calls, texts and email’s, but we also meet face to face to conduct test drives at a time and place that’s convenient. Our unique military test drive experience offers routes to match your driving conditions, be that country roads, motorways or city centres. 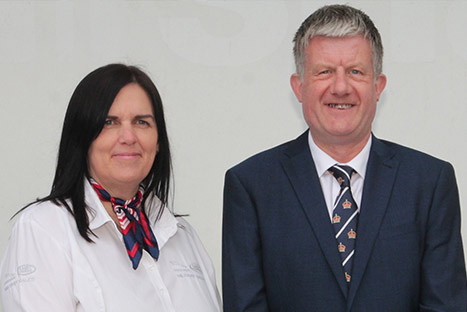 An allocated knowledgeable member of our team will personally work with you on a one-to-one basis, first of all finding out exactly what vehicle matches your personal needs and then raising quotations and order forms, whether home at work or our Retail Centre. Our sales mission is for customers to drive away with the vehicle that's right for them. Land Rover Military Sales Specialist for our Army and RAF customers in the UK. Pauls’ career, has taken him all over Europe, always promoting British cars and for many years worked in Germany. He returned to the UK and continued flying the flag by joining Marshall Military Sales. his experience continues today and his desire has not diminished. “Our products are world beating and I am always astounded by the resilience, kindness and start form where you stand attitude of my military customers. Especially when I consider all the troubles, and conflicts that they have faced during my career”. Paul joined Marshall military in 2000 as a Military Sales Specialist, Paul’s main duties are being responsible for looking after Land Rover enquiries and sales. For Paul no two days are the same, he loves the opportunity to deal with the Armed Forces, great customers! When we asked Paul what is his favourite vehicle he responded, “it’s hard to choose? With so many fantastic world beating models to pick from in the range, Evoque and Velar to name a couple”. 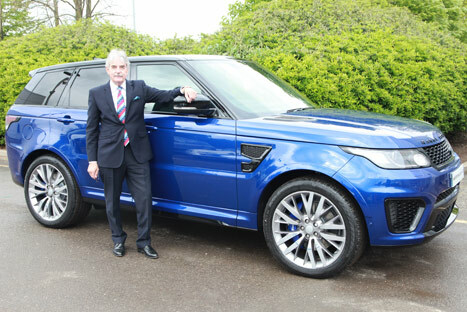 His favourite would be the Range Rover Sport SVR in Estoril Blue, and why? “Who wouldn’t? One just has to sit in the car, turn the ignition and a smile appears, a smile that stays with you until you finally arrive at your destination having taken the long way to get there”! Jaguar Military Sales Specialist for the UK & Navy Specialist for Land Rover. Dean joined us in January 2012 and in the last 5 years Dean has worked his way up within the department (Driver, Handover Specialist, Sales Admin). 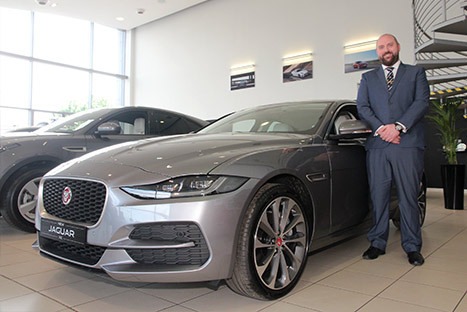 Dean’s main duties make him responsible for looking after Jaguar and Land Rover enquiries and sales, and he strives to deliver the best customer service possible. With Dean’s Military Experience of 23 Years Serving Queen and Country in the Royal Navy. Dean understands forces life and all the challenges that living away from home can bring for our customers. 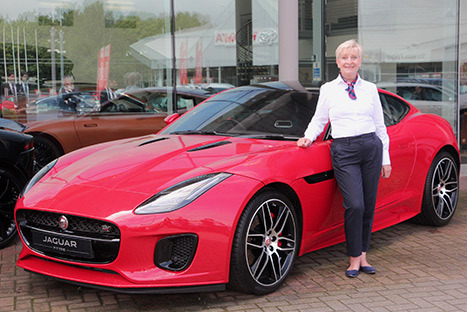 When it comes to Dean’s ideal drive he selected the Jaguar F Type Coupe 380 R-Dynamic. “Life. It’s not about figures. It’s about feelings. The moments that feed your soul. The occasions that take your breath away. The instances that leave you speechless”. Jaguar Land Rover F&I Manager. Terry has been in his role with military sales for years, and he has thoroughly enjoyed his time, being part of such hard working and enthusiastic team. “My main role is to provide finance and insurance solutions for our customers, which can sometimes be a challenge as we export into different countries and markets meaning different rules and regulations must be met. The best part of Terry’s job is meeting so many different and interesting military customers. “I love meeting different customers from around the globe, and often sharing some common ground as I myself come from a forces family that had postings around Britain and Europe”. Previous to working for Jaguar Land Rover Military Sales I held management positions in retail, within the DIY and Technology sectors. “This is the ultimate Jaguar XE sports saloon. The XE’s sports saloon body creates a unique blend of power and practicality. Its Jaguars most advanced, efficient and refined compact sports saloon ever and it’s packed full of exciting technology, which I just love. On top of that, the 3.0L ‘S’ gives unadulterated sports performance with an incredible V6 380PS Supercharged engine, it’s an absolutely fantastic car”! Our accredited Military F&I manager will make buying or leasing your new Jaguar Land Rover simple, flexible and efficient. A Confidential discussion with our Military Financial Manager will provide tailored solutions for your personal needs. We will be able to inform you of our dedicated forces range of finance and insurance products, tools and offers - all designed to match your purchasing needs. Terry makes your next purchase simple and flexible using our Marshall dedicated low financial rates, it’s easier, more convenient, and less expensive than you expect to own your new Jaguar or Land Rover. Our customer’s main event. At many retailers you won't find a vehicle delivery specialist, but Marshall Military sales are different; we believe in a dedicated approach to our customers and specialise each element of the sale, rather than a one cap fit all approach. Our Jaguar Land Rover trained Hand Over specialists reveal and present the vehicle and make sure our customers understand all the important features in their new car. Upon collection of your new Jaguar Land Rover from Military sales you will enjoy all the benefits of a hand over experience and learn about the VERSATILITY, TECHNOLOGY, CAPABILITY and PERFORMANCE of your new Jaguar or Land Rover. Our vehicle tutorial via the delivery specialist will walk you through all basics, explain the OPTIONS AND ACCESSORIES and will review the owner's and service manuals with you, too. Through this dedicated approach we ensure our customers receive the time they deserve upon collection and beyond, utilising our customer satisfaction follow up process ensuring they are completely satisfied. Jaguar Land Rover Military Customer Hand Over and Delivery Specialists (Germany BFG). Frances has been with us for 11 years as a hand over specialist, this entails conducting all the duties above. As hand over specialist I personally reveal and present our customers new vehicles, explaining all the different systems for their particular model. Many of my customers return on a regular basis and I get to know them quite well. I love the brand so I enjoy being able to promote the best these cars have to offer. I have seen many changes over the years, not only just the vehicles but also systems, and we have progressed and grown as a department. At present my favourite vehicle is the New Discovery 5. The All-New Discovery redefines the large SUV. Land Rover’s design and engineering teams have revolutionised the Discovery DNA to create a highly desirable, extremely versatile and hugely capable premium SUV . My name is Lisa Johnson and I started working for Marshall Military Sales on the 8th of February 2016. My main role is to look after our customers just prior to collection and then the really nice part is presenting a brand new vehicle at the handover stage. I love meeting all the customers on this exciting day and I would say this it is my favourite part of my job. I have 16 year’s customer service experience and really enjoy meeting new customers as I am a real people’s person. My favourite vehicle is Range Rover SVR as I love the styling and it sounds amazing. Luxury and performance, this vehicle drives like no other Land Rover and its muscular broad shouldered stance ensures it looks like no other. Sure-footed and agile, the vehicle handles and drives wonderfully . Our Military administration liaisons act as focal points for customer questions or concerns. Our dedicated liaison team offers EXPERT SUPPORT. HERE FOR YOU with fantastic administrative skills, Let Rachel and Becky know how they can help. From the moment the order is placed with us, to the day of collection Becky and Rachel are our customers first port of call. They are committed to our modern, innovative, robust and successful processes, and they are always ready for new challenges. Via coordinating with our sales team and Jaguar Land Rover they provide timely and accurate answers for our forces customers questions, Becky and Rachel are keen to keep an eye on the detail ensuring all the relevant documentation within specified HMRC guidelines is completed. 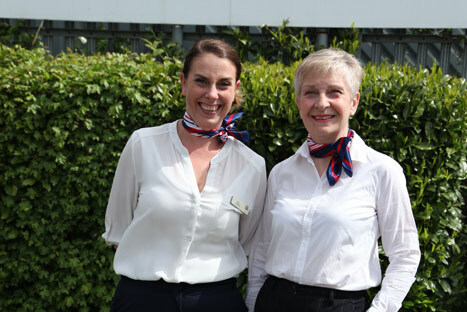 Rachel and Becky are the Back bone of our division and enable our customers to gain the full “customer first” experience. 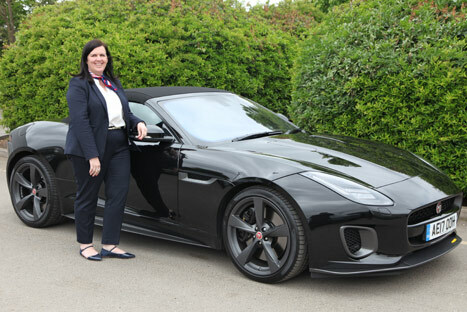 Becky started working for Marshall Jaguar in 2015. Looking after the administration and arrangements for all the tax free vehicles and BFG customers around the world, it certainly keeps Becky busy. The most rewarding part of Becky’s job is meeting the customers when they collect their new vehicle. Becky encapsulates our office ethos in her own words “We are not only work colleagues at Military sales we are a family”. Becky has worked in many different roles all of them being customer focused. 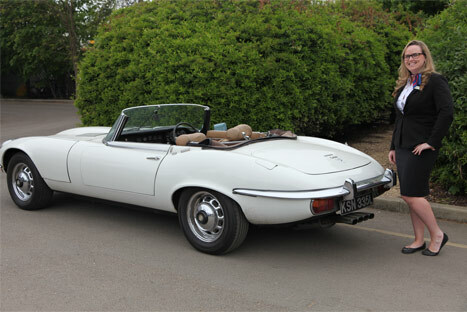 My favourite vehicle is a Jaguar E-Type. Its combination of beauty, high performance made this model is an icon of the motoring world. I joined the Military Team on the 5th October 2015. I came from retail / customer service background where I have also enjoyed meeting people and think this is still my favourite part of the job today. I am responsible for the Administration within the team which covers everything from the initial ordering of the vehicles all the way through to handover. 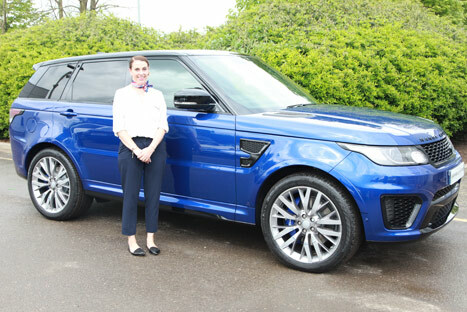 I feel very lucky to work for Jaguar Land Rover as they are British based and I work with such a lovely team. My Favourite car in the range is the Jaguar F-Type coupe, I love the shape, styling and of course the power and sports exhaust. Powerful, agile and utterly distinctive. A true Jaguar sports car. 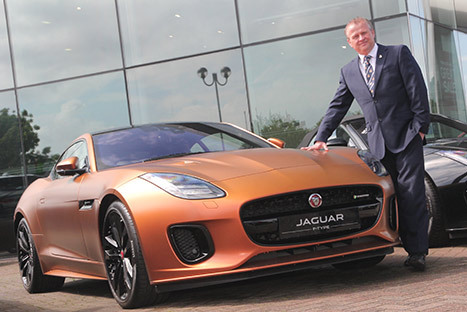 Over the last 15 years Richard has had one of the most exciting managerial positions, “To be able to hand pick a team at the very start of a new UK project for Jaguar Land Rover and build a team of specialists, create a division, and serve our Military customers is a great honour. Many things have changed over this time but his department’s core belief that it’s a privilege has not changed. As the largest Jaguar Land Rover Military Retailer in the UK with a proven track record of excellent customer service. Richard is so proud of the team and division that have been created. As a unique team of forces specialists each bringing something different to the business this has enabled us to make great advancements in the programme and sales performance alike. Prior to this Richard experience was in retail sales and customer service, his favourite part of the role is reading the verbatim and customer feedback, the reassurance that the team are looking after our forces customers well gives him great pleasure. Like Savile Row, Richard doesn't believe that one size fits all. That’s why we offer the expertise and experience to understand our military customers’ needs perfectly, whether they are selecting the first vehicle for an overseas positing and residual value is of most importance, or a lifelong family member in the customer’s ideal specification. 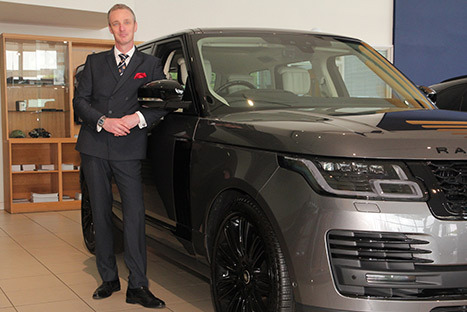 Richard’s favourite vehicle is the Range Rover it’s unmistakably sophisticated, modern, offers unrivalled performance and unique characteristics, our pinnacle SUV.